Hey all! This is a project I shared over at Whipperberry in July. This is by far one of my most favorite projects I've done! 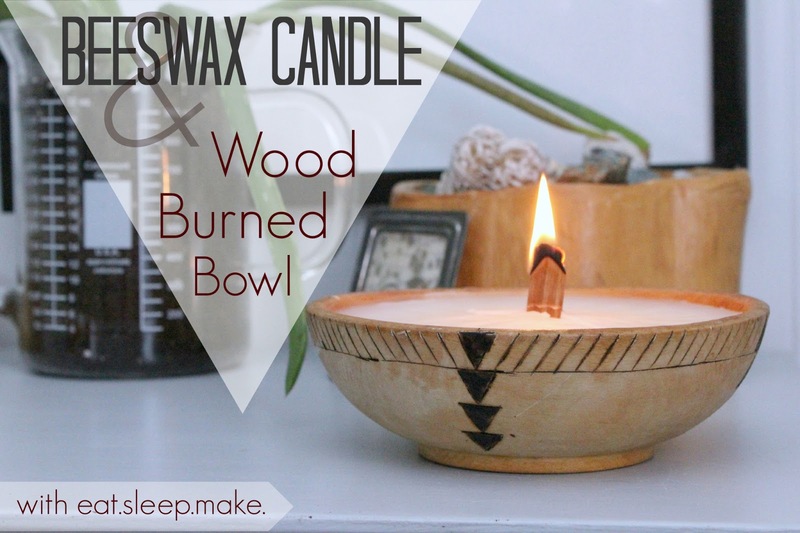 Now, let's make a scented beeswax candle.For the container, I'm using a wooden salad bowl that I bought at an estate sale for 25 cents. 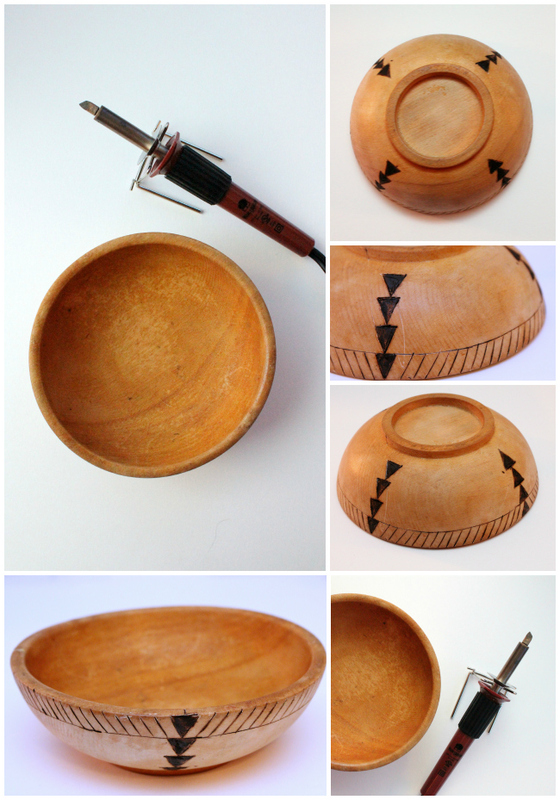 Start by customizing your bowl by burning a design into it. If you don't have a wood burner, you could always paint a design. Next is the hardest part. You need to guesstimate how much wax you will need to fill your bowl. You want this to be in smaller chunks so it will melt properly. I just stabbed the block with a knife and plied chunks off of it. 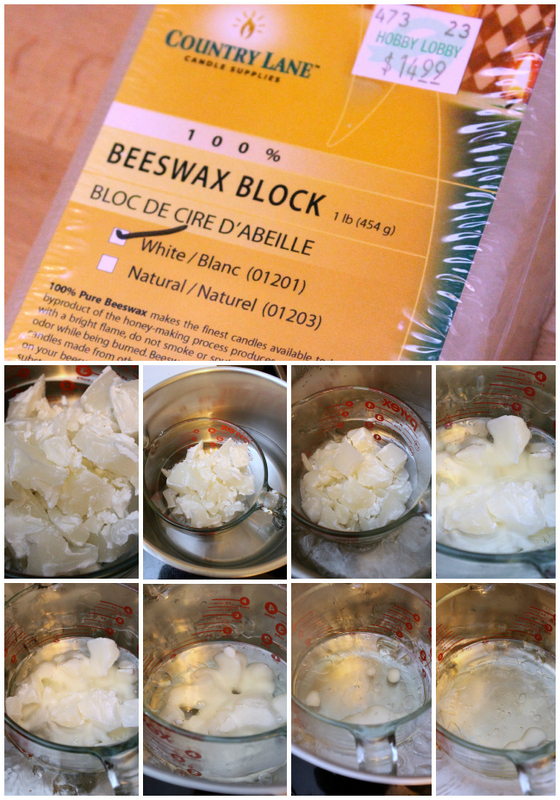 You need to use a double boiler to get the wax to melt without burning. I kept my stove set on medium. I found that if I turned it up higher than that the boiling water would jump into the wax (which, like I discovered, causes issues in the drying process). 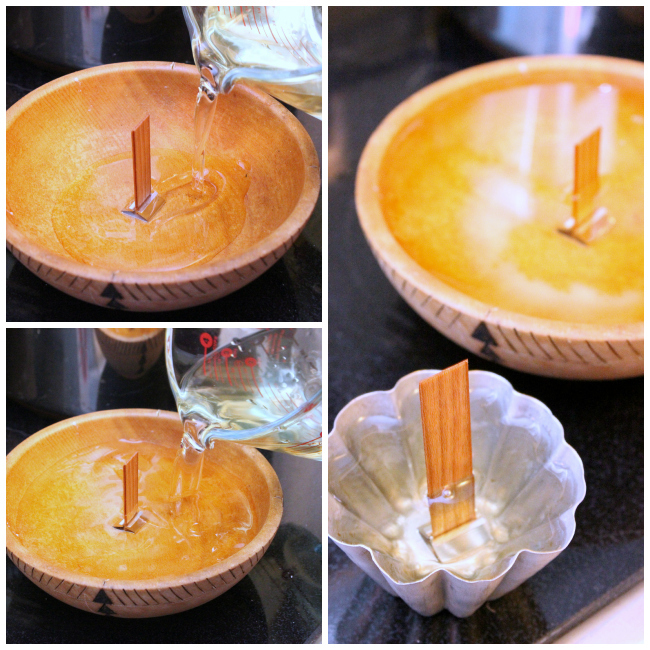 Use a cooking thermometer to monitor the heat of the wax. It should get up to about 160-165 degrees and never go over 185 degrees. Now, pour the wax in your container! You can place the wick in first or after it is poured. It doesn't really matter. I had some wax leftover, so I used a vintage baking tin for the rest. The drying part can be quite tricky. If it dries too fast, you will have cracking (like you can see in the photos of mine below). Upon doing some research, it is best to place the containers on a cookie cooling stand so that the wax can dry from the bottom up. This will also help prevent cracking. Once my wax was completely cooled and hardened, I saw some separation from the side of the bowl and discovered all the water that had jumped into the melting wax had caused the wax to pull away from the container. The water all dumped out, but it's definitely good to try and avoid this. 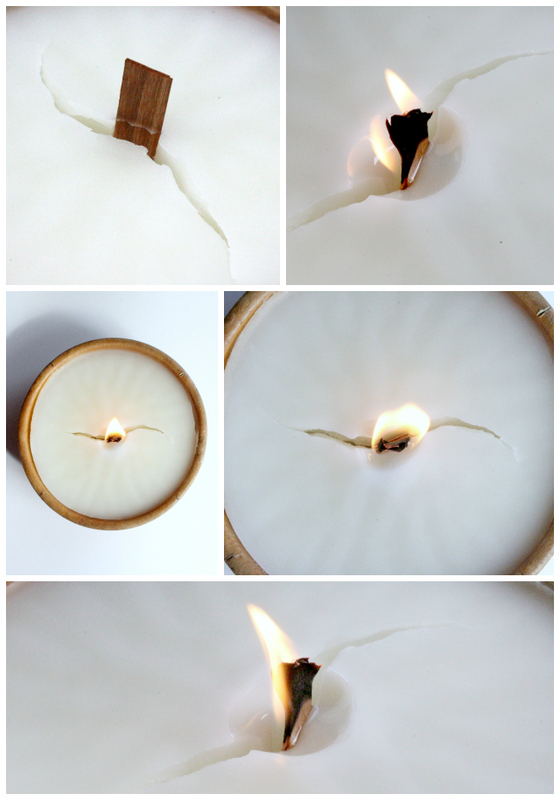 Fortunately, after burning for a little while, the crack will fill itself in, so no worries! I'm definitely over-the-moon pleased with how this turned out! This was my first run at making candles and I think I'm hooked. Would this not be an awesome house-warming gift, too? Id really like to try this! Ive never heard much about wood burning but you make me really want to try it! 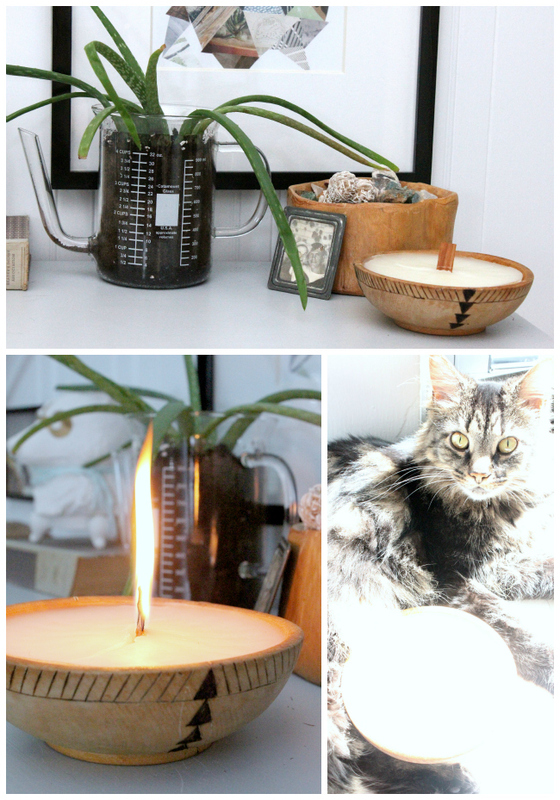 The bowl is so cool, and thanks for the candle recipe, ive always wanted to make a candle! I just love this! 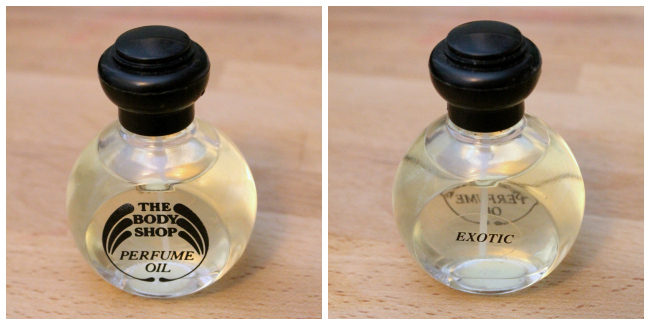 it must smell so good!